Seafood lovers be warned. That delectable slab of seared tuna on your plate soon could become a lot smaller — and more scarce — thanks to climate change. 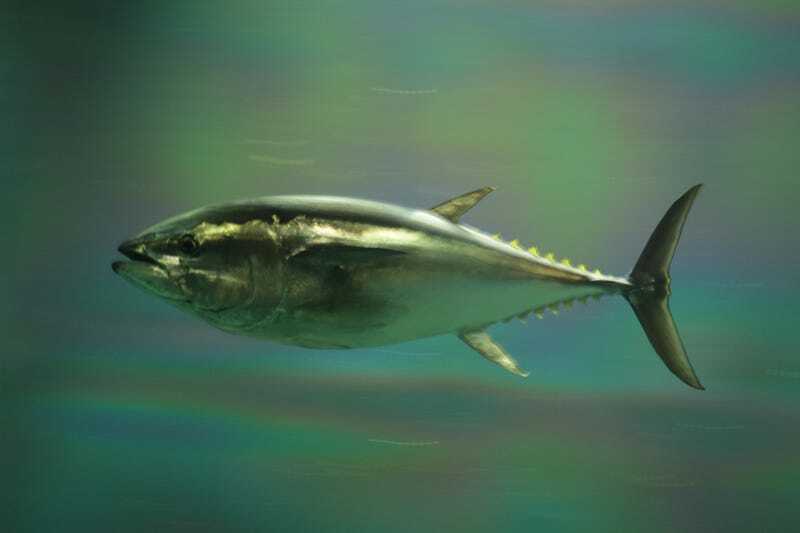 As ocean temperatures climb, many species of fish — tuna among them — likely will shrink, decreasing in size by as much 30 percent, according to a new study published in the journal Global Change Biology. The study confirms the authors’ previous research, which showed that fish won’t be able to get enough oxygen to grow if ocean waters keep heating up. Fish, as cold-blooded animals, cannot regulate their own body temperatures. When ocean waters become warmer, a fish’s metabolism accelerates, and it needs more oxygen to sustain its body functions. Fish breathe through gills, organs that extract dissolved oxygen from the water and excrete carbon dioxide. The problem is that the gills’ surface area does not grow at the same pace as the rest of the fish’s body — and warm water contains less oxygen than cooler water. If a fish like cod grows 100 percent larger, its gills might only grow by 80 percent or less, according to the study. Tuna, which are fast-moving and need more oxygen may shrink by as much as 30 percent, researchers said. By contrast, brown trout, which are not as active as tuna, will only decrease in body size by about 18 percent with each degree Celsius of warming. Cheung and Pauly responded to the criticism “by restating both the principle upon which the 2013 study was built, and by re-computing the effect of warming on shrinkage in more detailed fashion, which increased the shrinkage,” Pauly said. With a drop in maximum body size, potential fisheries production will decrease “and that will directly affect the fishing industry,” Cheung said. This could result in a loss of potential catch amounting to about 3.4 million metric tons for each degree Celsius of atmospheric warming, he said. “Some parts of the world, such as in the topics, are going to see even larger decreases,” he said. “This will have substantial impacts on the availability of fishes for people.” Scientists said that fish are already shrinking. Oxygen scarcity will affect a multitude of sea creatures, not just smaller fish, but also larger species further up the food chain. “They are affected by global warming because their prey are,” Pauly said. Marlene Cimons writes for Nexus Media, a syndicated newswire covering climate, energy, policy, art and culture where this story was originally published.